Stop in and spend an hour or two and you will have a fun time. Bring your kids, too. This is good, clean and wholesome fun. Moms and dads can race along side with the kids, if they choose. Or stand back and enjoy the smiles and laughter. And it won’t cost you an arm and a leg, either. 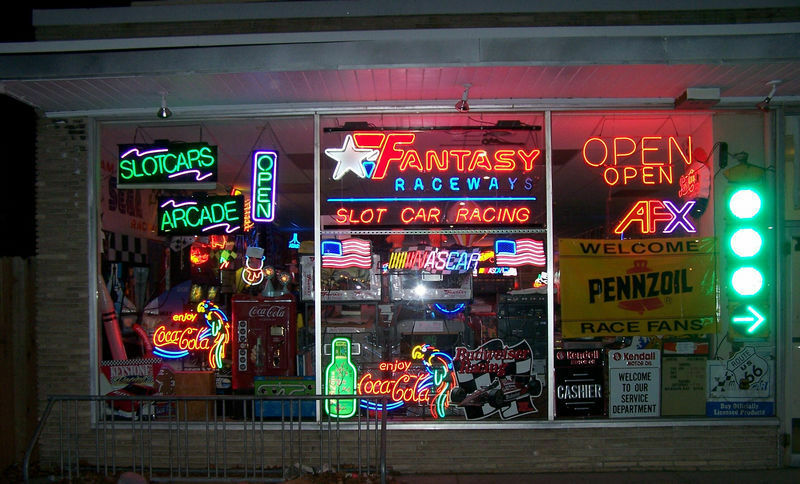 Fantasy Raceways is like stepping into a time machine! Besides slot car racing, it is also a Classic Video & Pinball Arcade – featuring an assortment of classic arcade video games and pinball machines! Have your Birthday Party here. We have a great package deal for parties,Cub Scouts,Boy Scouts, Car Clubs, etc. We will set up a structured race event for your party and even provide the cars and controllers to race. Just Show Up ! !